Offering interior design services, alongside architecture, has been a part of CGD’s DNA for many years. Our methodology integrates and considers the interior as we develop the shell. We find this interdisciplinary approach allows for a measure of streamlining, giving our clients the chance to look through a cohesive lens as we progress through each phase. Additionally, our architects and interior designers, together, create an enjoyable synergy that strengthens the design process, and thus, the end result. 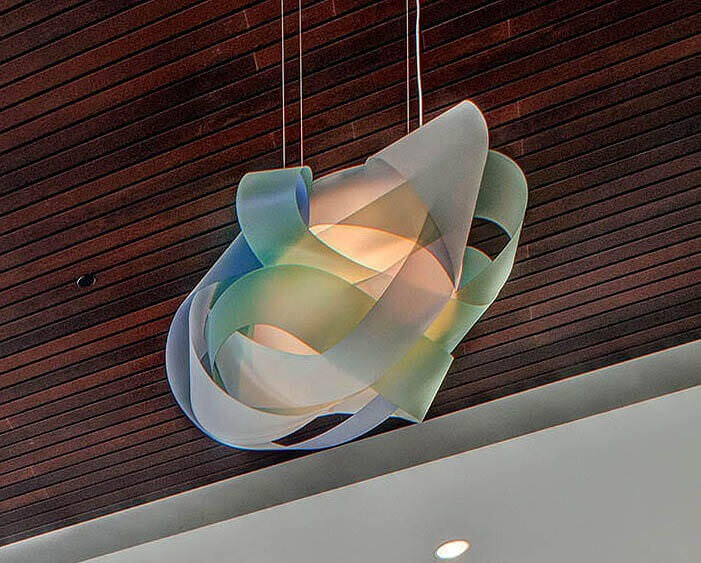 On the rare occasion, our interior design team takes on a project outside of this practice. 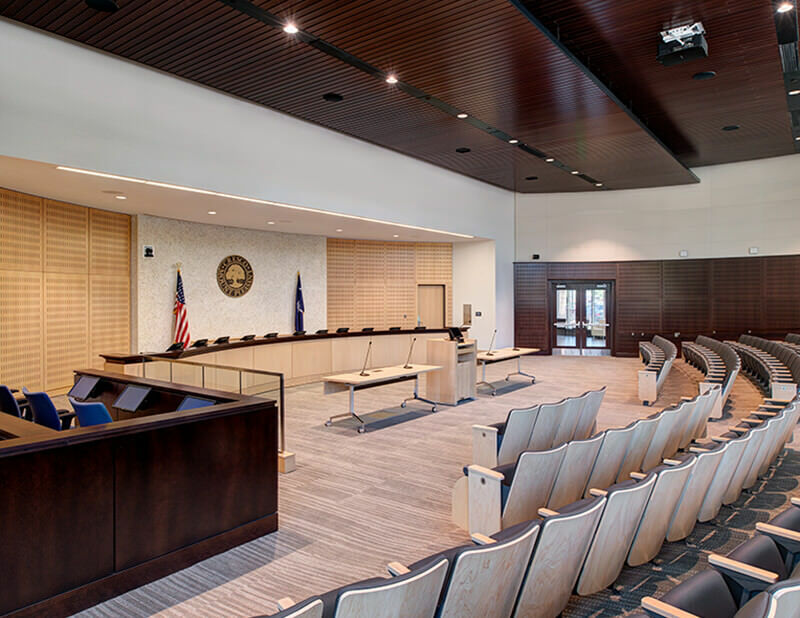 One such case is the design of Mount Pleasant Town Hall, just over the bridge from Charleston, South Carolina. 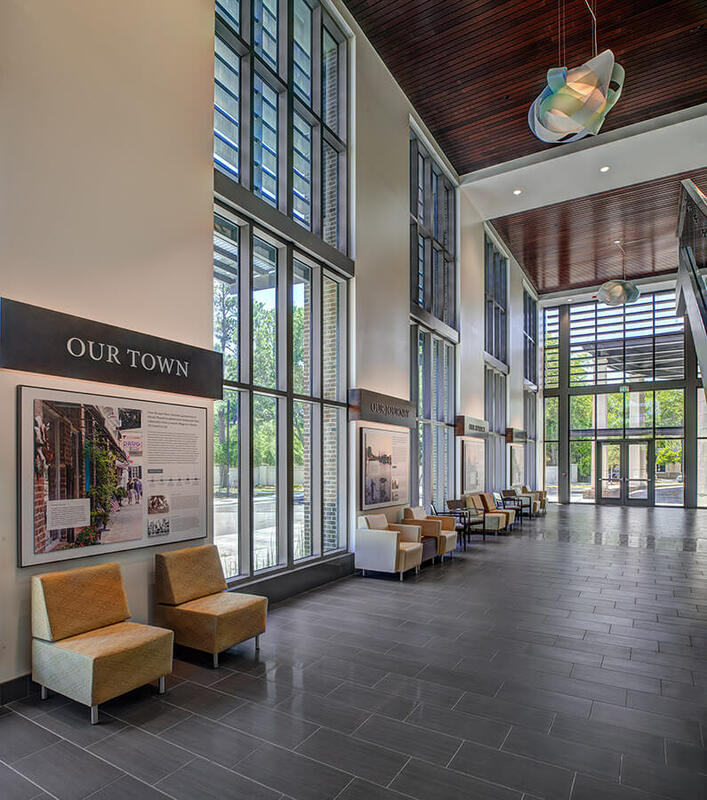 Our Director of Interior Design, Andrea Kuhfuss, and Katherine Fishburne, of Innovink (at the time), were commissioned by the Town of Mount Pleasant to reflect the charm and character of this coastal community in the 92,000 SF of new civic space. As native South Carolinians, Katherine, a local, and Andrea, a frequent visitor, took easily to the task. Plenty of natural light made organic materials and colors a fitting choice to provide a calm environment for staff and guests. Sweetgrass baskets inspired woven wall coverings. Tabby concrete full of crushed shells elegantly nod to what is often underfoot. 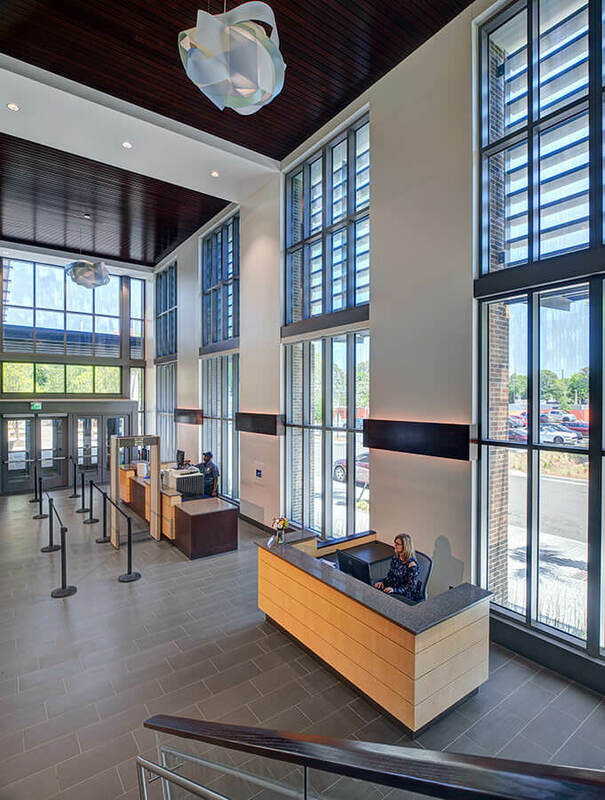 And in the lobby, creature-like fixtures hang high above storyboards that showcase the town’s history and offer visitors a sense of place. 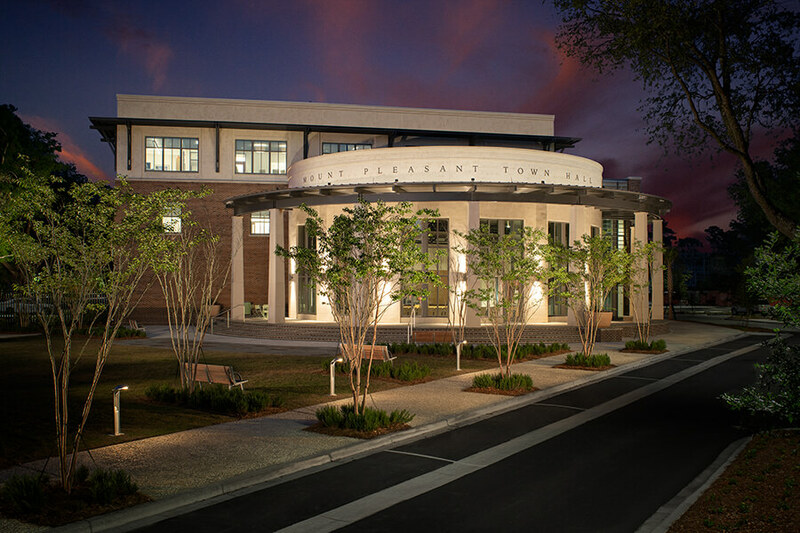 Andrea and Katherine beautifully integrated the refined flavors of the Lowcountry with the high-traffic and function of civic operations to maintain the dignity and sophistication of this Town Hall for years to come. 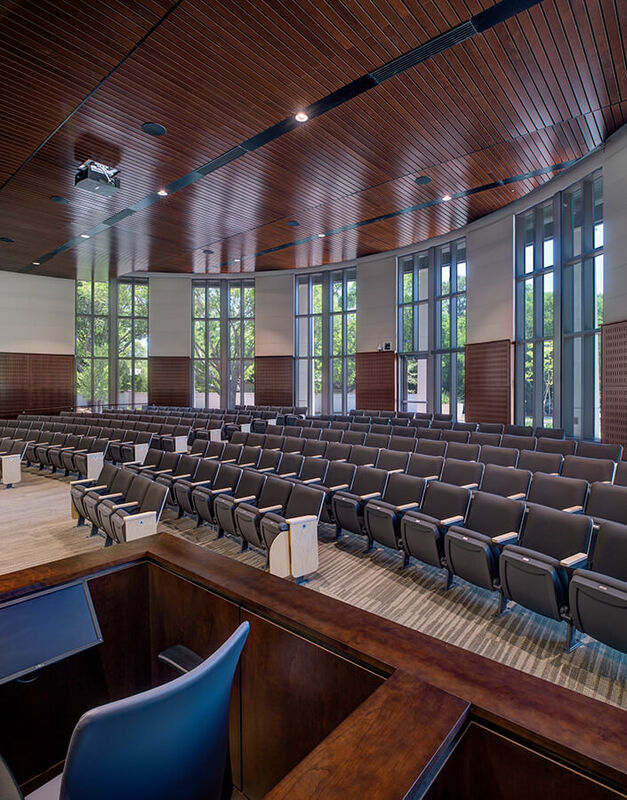 *CGD and Innovink worked on Mount Pleasant Town Hall with architect of record, Stubbs Muldrow Herin Architects.